Stone Hunter, GirlwithGems, Deathspi and 3 others like this. Stone Hunter, Deathspi, suzanne2 and 7 others like this. I'm not a fan of opals, I think I've said that before. Your opal has changed my mind and my heart. It's lovely and a perfect shape and a perfect size. Please put me in as first dibs if you ever want to part with it. lovedogs, Burmesedaze and voce like this. 3.44ct Malaia garnet I just got today. First pic is vendor, others are mine although they are not good. I'm very happy. Ebay find! Stone Hunter, chatoyancy, pwsg07 and 1 other person like this. The other new arrival today. 2.26ct green "copper bearing" tourmaline. First pic is vendor, others are mine. I was expecting the color to not be quite as vivid IRL than the pics because of my other Cuprians. I'm happy. Ebay find again, same vendor. Stone Hunter, chatoyancy, voce and 1 other person like this. LOL!!! @suzanne2 i haven't been able to enjoy it yet. Its being set now. I shipped it off a day after I inspected it. I believe this opal is going to warm my heart for years to come. I am 'middle aged' as my 97 year old grannie says and I finally found an opal that sings to me. MissyBeaucoup, suzanne2, prs and 1 other person like this. On my phone and IRL the gemstones look more brilliant and redder than how they look on my computer. Sorry for the lack of a manicure, but growing up my piano teacher always said you can't play piano with long nails and it feels weird for me to have long nails, even after I stopped playing piano regularly. YC, Stone Hunter, Acinom and 7 others like this. Wow! Some beautiful gemstones! Fo those of you that use them in rings or other jewelry- do you have someone in particular that you work with? Huh...just realized that I've pretty much worked with a different vendor for each of my pieces... I guess it's because I'm always hesitant to go full custom with anyone (where I'd be creating the piece from scratch). Instead, if I see something they've made that is close to what I was envisioning, then I'd go with them. A sapphire from Multicolour. Their picture, then my pictures. IRL, it appears a compromise between the two. TheGarnetGirl, Stone Hunter, princessandthepear and 8 others like this. Wow!!!! LOVE the heart shape!!!!! Stone Hunter, SparkliesLuver, princessandthepear and 3 others like this. In my quest for a nice crimson red CS, I stumbled upon this pretty Umba Garnet from Litnon, and decided to take a chance on it. It is soooo hard to capture the color I see in person, but it’s really beautiful and very consistently the crimson color vs shifting. I love the size & color. It’s 2.36ct, 8mm & noted to be IF/VVS precision cut. I think it’s actually much prettier & more crimson color in person than the vendor pics, but that was noted in the description as well. Stone Hunter, LisaRN, USCgal and 7 others like this. A couple more in outdoor morning light of the above Umba garnet from Litnon, but this time taken with my iPad Pro, which seems to not black-out the stone as much as my cell phone camera did when trying to capture it face-up. It is definitely still more ‘red’ than the pic shows, as the camera seems to make it look more orange-ish red I think, but in person, she is a perfect, bright, crimson red color. Stone Hunter, LisaRN, USCgal and 8 others like this. Deathspi, Stone Hunter, princessandthepear and 5 others like this. Daniel Davies 1.95ct purple/pink tourmaline. I couldn’t get the bright colour from his video. Mostly I saw just a dark purple stone in real life. I took photos in sunlight, fluorescent light and dull cloudy daylight (typical British weather lol). kgizo, Stone Hunter, LisaRN and 4 others like this. @Maisie I think that bottom left photo of yours is not far off that vivid colour if I’m honest! I was hoping it would be that colour most of the time. Deathspi, kgizo, Stone Hunter and 10 others like this. I bought this gorgeous lavender colored spinel from Jim McCormick on FB. 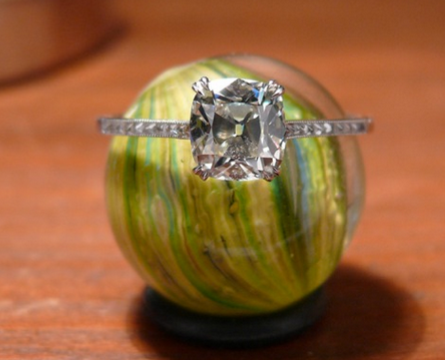 It’s a huge 3.93ct in a step cut. I love, love, love the color but, as it turns out, I’m not big into step cuts (who knew ). It also has something that looks like a small window to me (not totally sure). Anyway, I’m sending it back but I wanted to put it out there because the color really is gorgeous and I would love to see someone in PS land rocking this baby in a ring! ZestfullyBling, kgizo, YC and 9 others like this. @elle_71125 I have another lavender EC spinel on the way, but saw your video. Wow! Do you see blue in this stone? Any pink? I would love your impressions since you've seen it in real life. I reached out to Jim, but would like your opinion! Thank you so much for sharing this! I’m certainly not a pro when it comes to describing color but I would say that outside, it has a blue / lavender color. The blue definitely comes through out there. Inside, it takes on a distinctly lavender color. Not pink...just more of the purple hue, if that makes sense. I really like the color both inside and out. I tried to capture the inside color (my last pic) but it looks closer to the top vendor pic irl. I saw the one you ordered from TGP and would definitely say this one is more pastel in comparison. strawrose, chatoyancy and Acinom like this. Wow... I’m glad I didn’t go for that garnet. Thanks for the comparison pics. Here is a rubellite tourmaline from mastercutgems. elle_71125, kgizo, Stone Hunter and 3 others like this. New pair of medium grape/lavender spinels From yvonne raley. On hand is vendor photo. They are just as pictured, but better! So full of fire! Can't wait to wear these as earrings. elle_71125, kgizo, princessandthepear and 9 others like this. Acinom, elle_71125, kgizo and 7 others like this. Glowy purple amethyst cab from Seda Gems caught my eye on Instagram. Arrived today and is perfect! kgizo, Acinom, LisaRN and 5 others like this.